The saga surrounding the controversial decision not to award a prize in the 3D category of the Great Southern Art Award continues. Two artists with entries in that category have spoken out publicly. One of them has withdrawn his entry from the exhibition in protest, three weeks before the exhibition closes. In a comment on Facebook, sculptor Jason Wooldridge wrote "I was insulted personally but also felt it was an affront to all applicants. The organisers had not considered the possible damage to the reputation of artists who are trying to make a way in this fickle business, a business that is hard enough already without 'experts' telling the public that your work is no good." On his decision to withdraw his magnificent whale sculpture from the exhibition, Jason added "I had asked them just to withdraw it from sale, but they dug their heels in and said that I would have to remove it....so i did." 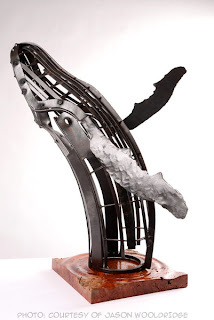 Seemingly confirming my suspicion that controversy does not attract artists to competitions, local sculptor Melaine McQuillan wrote "Apparently the judge thought that not awarding the prize would 'encourage a broader approach' what a laugh! I used to be a regular entrant.. I guess I need say no more." I have avoided the Albany exhibition myself for the last few years – partly due to lighting issues in the old venue (my paintings do not mix with mercury vapour lamps) and partly due to the controversial history of the event. I have sent my works over 200km to a different exhibition instead. With a much better venue for this year's exhibition, I decided to give it another go but I may rethink that decision next year if controversy remains the order of the day. 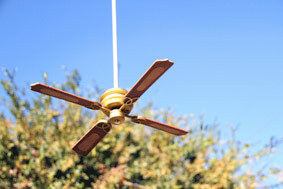 "Thermal Lift is a scaled down miniature domestic ceiling fan, activated by a hand-crank. Like much of is [sic] work, this piece which is suspended just above head-height, creates a sensorial response to both architectural spaces and the natural environment in which we live." I'm sure it does – although, from the photo, it looks like it's just a small ceiling fan hanging outdoors. I guess it's a case of "juxtaposition". What's flabbergasting to me is that the person who produces and sells something like this as art, and perhaps it is since a photo tells us little, cannot find a prize-worthy entry among any of the quality pieces on exhibit in Albany right now. I believe the organisers should think more carefully about their choice of judges next year and decide if they want controversy or credibility. If they want the exhibition to be respected, they have to show some respect to artists who make the exhibition. Without them, it's nothing. Controversy, in my opinion, is not a winning formula. personally, with regard to the installation in the photograph I find this work menacing/playful because of the way the sublime beauty of the biomorphic forms visually and conceptually activates the remarkable handling of ljght. Or is that the typo you mean? But aren't critique generators marvellous? Hi Andy, Jason here....I've tried to send you an email, but my iPad does not want to do the right thing. I just wanted to say what a well written and researched blog this is. You have made some really excellent points. We all have to remember that we live in deepest darkest WA. Does high-brow, Emperor's new clothes style art have a place in regional Art shows/competitions? I feel totally stitched up by the judges and the organisers. I now have my sculpture safely back in my dining room. I look at it now and feel some embarrassment, but have to remind myself that I went to art college and have a degree in illustration and was a teacher of Art in the UK and also Head of Art back in a private school in Kent. I have sold my work to collectors in the UK and in Australia....I will recover....and will become more careful as to what kind of competitions I enter. Thanks for visiting Jason and for the thumbs up. I don't think you've got anything to be embarrassed about. In fact, I really feel for you guys. One of my mates had a piece in the same category. Finding the right competitions is hard work. In Perth I used to be surrounded by people who'd suggest venues where they felt I'd fit in. Down here there aren't that many choices. Albany has a bit of history of controversial awards (like I've not encountered elsewhere) which is a shame for a community exhibition. personally I'm troubled by how the sublime beauty of the biomorphic form seems very disturbing in light of the droopaciousness of the work. Hmmm, I like it. I don't get it (apparently no one does as the manufacturer still owns it), but I like it.